Removing rust stains created by automobile battery acids, lawn fertilizers, and Irrigation wells containing high amounts of iron minerals can be challenging. Iron minerals being constantly applied to any material will over time change to the brownish orange color. Not all wells contain iron, but the ones that do are easily noticeable after irrigating for short periods. The appearance of your homes exterior concrete, pavers, fencing, or walls will continue to stain deeper and darker in color. These pictures are from a fairly new neighborhood. This homeowner installed an irrigation well to water his grass and after a few weeks or watering this was the result. Metal patio tables and chairs will eventually leave rust spots on your patio where they meet the concrete. The same situation occurs with metal smokers and gas grills. Over time they start to rust and will leave rust stains on the surfaces they reside. Placing your grills on pads and patio furniture on outdoor rugs work great. If rust’s coming from the irrigation well you can purchase separate “Add-On” devices that filters and helps remove the iron minerals. This option requires a monthly maintenance activity of adding a powder mixture to to this device, which can become quite expensive. If you fail to replenish the iron reducing powder each month then you are going to start to see rust. 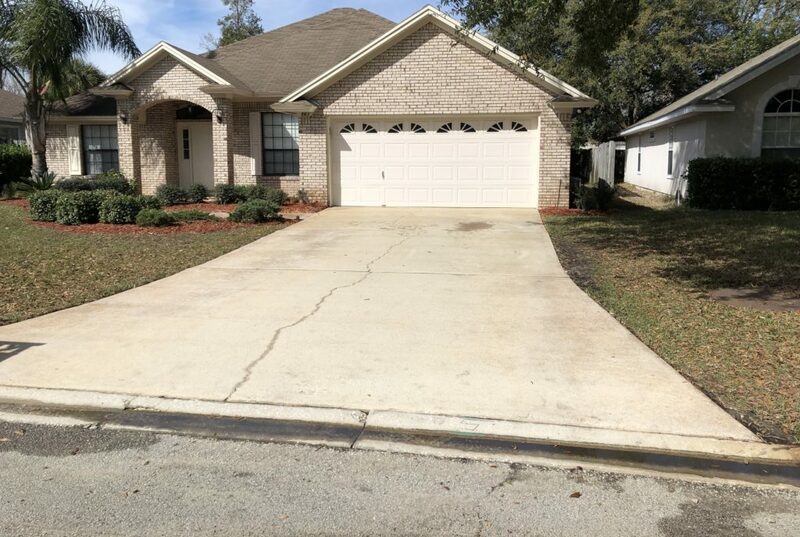 Depending on various factors sometimes customers don’t know that they have a rust problem until after their driveway and sidewalks have been pressure washed. If you know that you have rust and want it removed please note that “spot” treating rust stains and achieving a uniform quality finish color of the concrete is highly unlikely. Rust removers are acids and change the color of just about everything they touch with the exceptions of plastics. If there is rust staining from overspray of sprinklers it’s impossible to blend the colors into the unstained areas. If you have just a small rust spot on your driveway then a spot treatment makes sense. 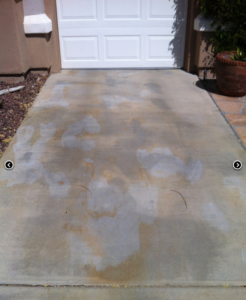 Spot cleaning larger stains leads to a noticeable difference in the color of the concrete. 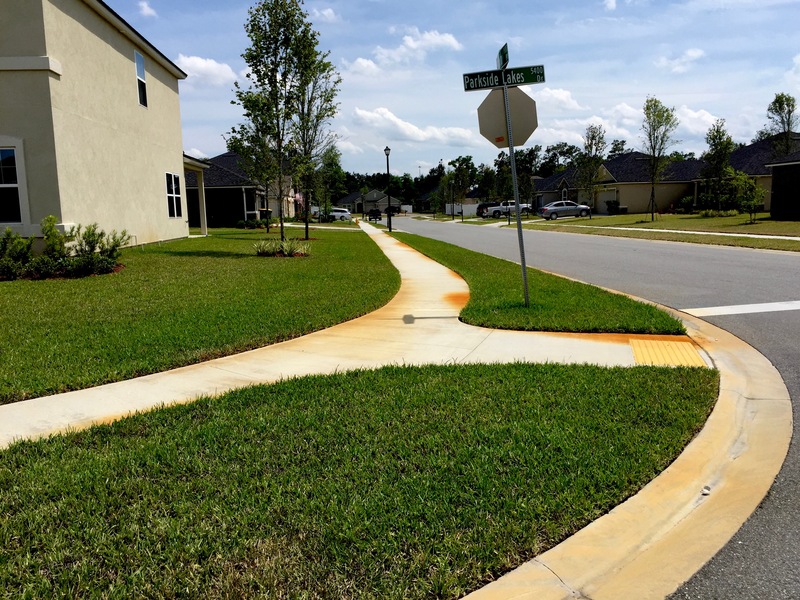 If you have rust all the way down the sides of your driveways and sidewalks then it is recommended to treat the entire driveway or sidewalk to achieve UNIFORM results. 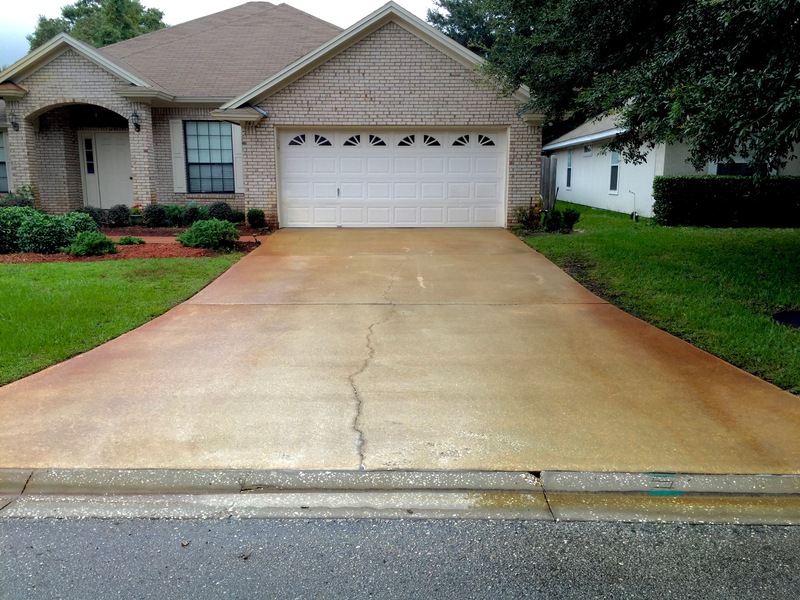 Rust removal for a standard four car driveway can cost about $700 to $1,000. The Pressure Kru doesn’t recommend paying to remove rust unless the rust causing issues have been addressed and removed. 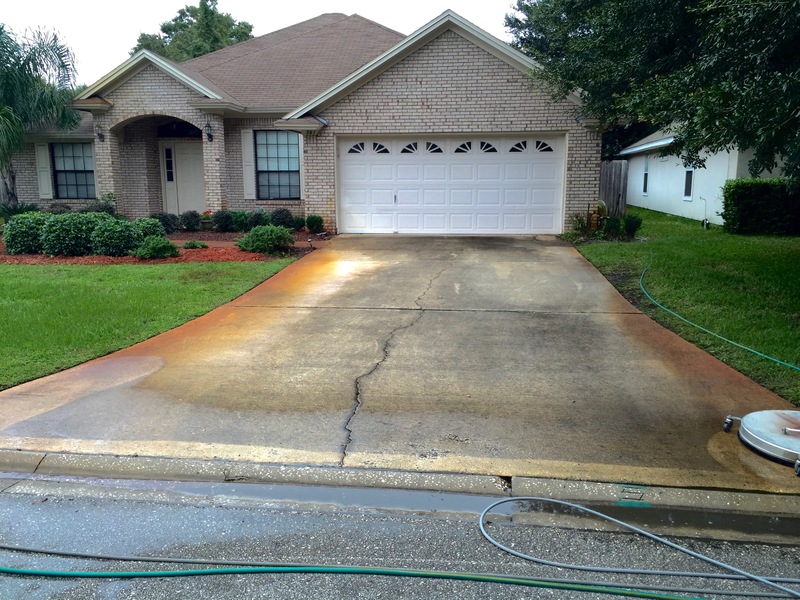 The images below are from a customer that wanted their driveway pressure washed to remove the rust. 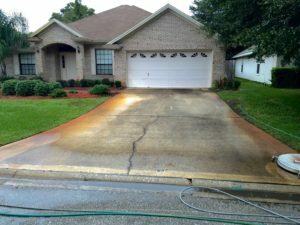 After reviewing the options, the homeowner wanted the driveway pressure washed, declining the rust removal service. Most homeowners don’t agree with purchasing additional equipment, installing that equipment, or having to spend $50 a month on adding powders each month.